We try to find the very best accommodations in each location with a goal of maximum comfort without using impersonal or corporate properties. You’ll always have a room with a private bathroom. Ocean views are booked when available on all trips. No, many of the routes on our walks are not open to dogs and some of our lodging is not pet friendly. If you’d like to take an inn to inn walk with your dog, let us know and we can prepare a modified route for you. Yes, well behaved and active children love our trips. Most parents find they themselves tire out far earlier than any of their children, regardless of age. What is the largest group? Many of our inns are quite small so we try to limit group sizes to 12 or less. If you have a larger group, we can modify our trips to try to accommodate the group. 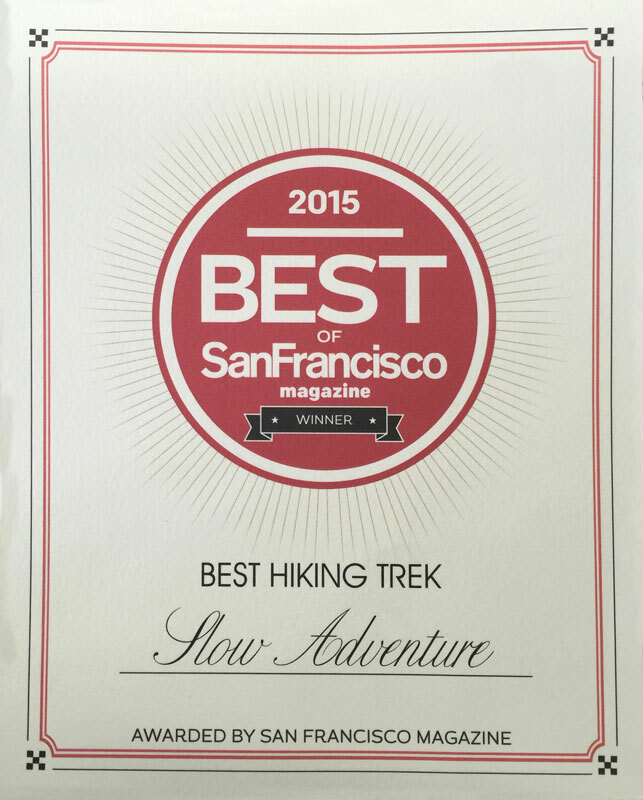 Yes, all of our routes are safe and we have many solo walkers enjoy our Slow Adventures. Are there airport shuttles or car services? Yes, please ask and we will provide information about ground transportation. If I drive to the starting hotel, how to do I retrieve my car at the end of the trip? What airports are best to fly into for a Slow Adventure? The closest airport for our Bay To Bridge or our Sunset Special trip is San Francisco (SFO). All other trips are best from San Jose (SJC). What do I do if the date I want to travel is not listed? Please email us and we can try to work on modifying the trip to assure you will avoid any difficult tidal issues. Why do some trips have specific dates and others do not? Several of our trips have river crossings or tidal issues with the route. This necessitates that trips start on specific dates so you will have the easiest walking conditions. When is the best time to take a Slow Adventure? Our trips are offered April through October. We recommend May or September for the optimum weather. However, April and October can be lovely with a slight chance of a shower or cooler days. June, July, and August are generally foggier and cooler in California. Our Croatia trips are best in May and September with summer months being quite warm, even hot. How do I reserve a spot on a Slow Adventure? Please send an email or use the form on the website to send in a deposit of $500 per walker. All lodging including taxes and occupancy fees, local guide available 24/7 by phone/text/email, trip booklet with maps and historical information, breakfasts each day, nature guides, and a memorable trip souvenir. You’ll be responsible for the remaining balance of your trip 60 days prior to your departure. Yes, our reservation and payment services are fully automated and we accept all major credit cards, including American Express. No, the initial deposit is not refundable. However, in most cases, it can be transferred to a future trip without loss of the deposit. What other areas should we plan to visit before or after our trip? If you are coming from a long distance, we recommend trying to add a few days at the start or finish to enjoy some iconic sights such as Big Sur, Carmel, Pebble Beach, Yosemite, Sausalito, Napa and Sonoma. If you are taking our Croatia trip, we offer extensions to the capital of Croatia, Zagreb, as well as other popular spots in Croatia. How difficult is the hiking and walking? If you normally walk or hike on a regular basis, you will find all of our walks to be enjoyable. We do send you some training tips so you are well prepared. These trips are all designed for avid walkers who enjoy being outdoors and experiencing nature at a slow and relaxed pace. If I get tired, can I get a ride to the next hotel? Most of our routes are serviced by Uber or a taxi service. However, you may need to walk some distance to meet up with a road or facility for the meet up with a car. Do I need to bring walking sticks? No, there is very little elevation on any of our hikes. Our Croatia walk is much hillier than our California walks but walking sticks are not necessary unless you have a personal preference for them. None of our walks involve much “technical” hiking so any comfortable shoes or lightweight boots are best. Which Slow Adventure is right for me? Our trips are rated easy, moderate, and challenging. If you are physically fit and love to walk, you’ll have no problem with any of our walks. If you are new to walking and are working toward fitness, choose one of our shorter and easier routes. Can I arrange a guide? If you wish to have a guide for a portion of the trip to provide special insight into the route or the history, this can be arranged for an additional fee. What do I have to carry along the trail? You need not carry anything more than a bottle of water, the trip booklet, a camera or binoculars, if desired. How do I find places to eat? Your trip booklet will outline the best and closest places to dine along the route. How does my luggage get from inn to to inn? You leave your luggage at the front desk of the hotel each morning before you depart. Your local guide will move your luggage to the next hotel where it will be in your room or at the front desk upon your arrival. How do I get from inn to inn without a guide? You will be given a trip booklet with custom designed maps and directions together with historical notes and information about restaurants, delis, and markets along the route. Following the route is fun and heightens your sense of adventure. You’ll have a knowledgeable local guide available by phone, email and text, should you have any questions along the way.